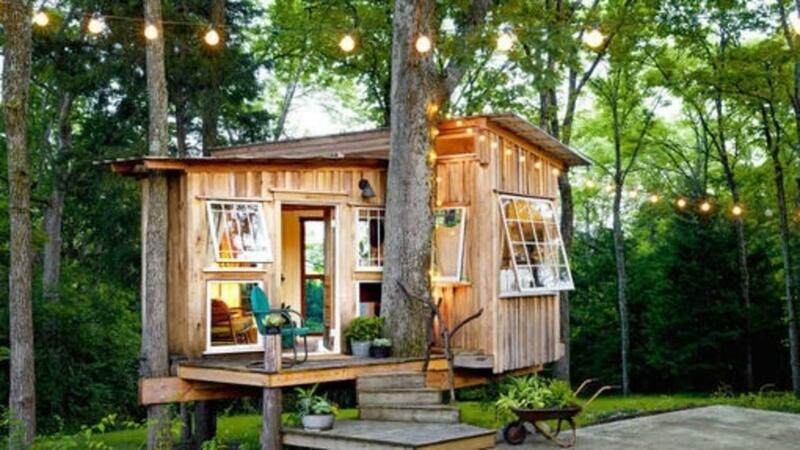 Transform A Tree House Into A Backyard Retreat! Be inspired by this transformed tree house – what it lacks in right angles (zero!) and square footage, it more than makes up for in natural light and evening breezes. Instead of retro camp stools, try a plush vintage sofa. In an appropriately outdoorsy shade of moss-green, the 1950s-era seating encourages visitors to linger well past curfew. Instead of flashlights, try floor lamps. Sure, a flashlight adds drama to a ghost story, but this sort of grown-up retreat calls for full-on fixtures—and, yes, electricity. What’s hiding in that trunk? A broom closet! Every tree needs a trunk, and this one’s home to a host of cleaning supplies.